Fun retro house ideal for groups of adults or families and provides tons of lakeside amenities with enough space to keep everyone happy! These Highlands NC Vacation Rental homes offer some Mountain views or Water views. Enjoy majestic long range mountain views for each room of the one level upper flat. Enjoy long range mountain views from each level of this town home. 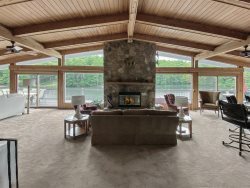 Enjoy the peace and tranquility of majestic mountain views while relaxing on the deck or hiking the nearby trails. Waverly Cottage on Biscuit Rock is an elegant mountain home that sits on a private pond, just an easy one mile walk to town. Beautiful upscale luxury mountain home available to rent or purchase. Perfect for large families, provides lots of leisure and recreation spaces. Gather the whole family in this large home with three levels of comfortable living. Just 4 miles to Main Street in scenic, downtown Highlands.